“World is a stressful place. 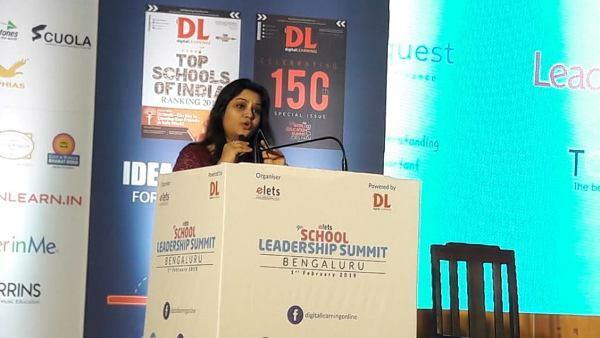 We need to inculcate emotional courage among our children so that they don’t get embarrassed in case of any failure,” said D Roopa Moudgil, Inspector General of Police, Karnataka, on Friday, while addressing the 9 th School Leadership Summit Bengaluru. The Summit was inaugurated by Murari Jha, Business Development Manager, Cloudwalker; Piyali Shome, Principal, Tattva School, Bengaluru; Shazia Ahmed, Principal, Aryan Presidency School, Bengaluru; and namrata Majhail, Principal, The Orchid School, Pune. The one-day long summit witnessed educators, policymakers, industry leaders and key stakeholders sharing innovative ideas, best practices, and latest trends. Most of them also opined that we can’t do away with technologies but at the same time definite guidelines for the same are required to use it effectively. The Summit witnessed interactive sessions on topics: The Future of Early Childhood Education in the Era of Digitalisation and Innovation; From Conventional Assessment Practices to New Age Assessment Tools – A Review of Best Practices in Continuous and Comprehensive Evolution (CCE); The Evolving Concept of Safety, Security and Hygiene in Schools: Prospects and challenges; and Necessity of Physical Education & Sports for Holistic Development of Children. Industrialists also deliberated through PPT presentations and the exhibitors showcased an array of innovative solutions during the one-day summit. The 9th School Leadership Summit Bengaluru felicitated 190 educational institutes — including preschools, boarding schools, and CBSE/ICSE affiliated schools — across the southern region of country for their exemplary contribution to impart quality education. Elets Technomedia Pvt Ltd, a premier technology and media research organisation of Asia and the Middle East, organises School Leadership Summits to showcase latest trends and the best practices of school education sector. The organisation will host the 10th School Leadership Summit Delhi on 12 April, 2019 and 11th School Leadership Summit Chandigarh on 27 April, 2019.